IMPORTANT - Restrictions on use Land only on the open fell. Cars cannot be left at the parking areas P1 or P2. All cars should be returned to the main car parking area by the fell gate. This is a mega site that works well in light winds. The best direction is an easterly. The take-off above the quarry is a bit tricky but the bottom landing, near the fell gate car park, is huge. From the A593 turn right (if approaching from the north) just past the petrol station over the small bridge. Follow the minor tarred road (very steep for a short section) to the fell gate. Access is currently denied to drive the quarry track. Three options are available:1)Leave any vehicles at the fell gate parking area. At the gate head towards the fell for 100m following the track then walk up the fell side to the right side of the quarry. 2)Drive the track for 800m until access to the quarry track is barred by a drop down barrier. Unload equipment and then return the vehicle to the main fell gate parking area.3)As above, but if access has been agreed a 4WD can be driven to the quarry area. If the quarry is working then permission is generally given if asked. 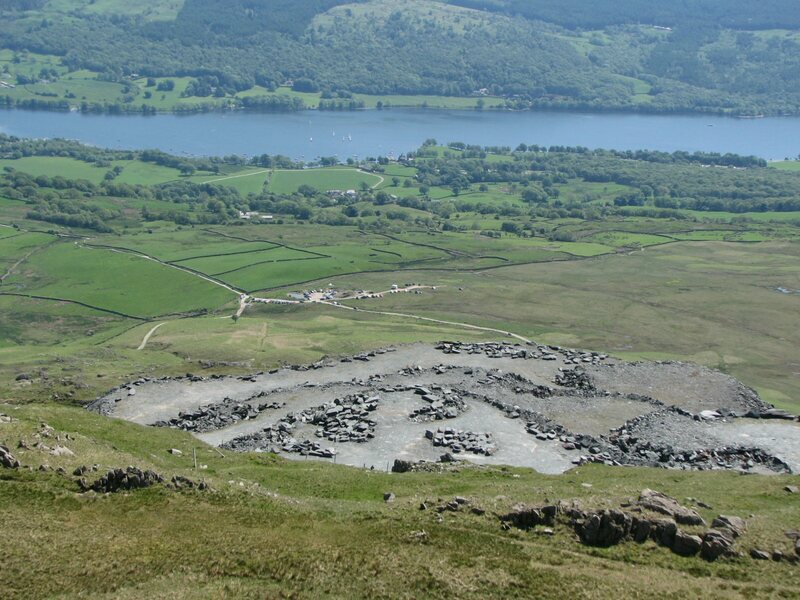 1)Head up the fell side to the right of the quarry from the track that runs north from the fell gate.2)Walk to the quarry via the track which has a short, steep section at the start or walk directly to the spoil heaps on the left of the quarry. This is an un-negotiated mountain site that has been flown for several years without any problems. Beware of the sea breeze pulling the wind off to the south. The summit should be avoided in fresh winds. Do not attempt to top land except in very light winds; a rotor exists along the length of the summit ridge. Public telephone in Coniston village. 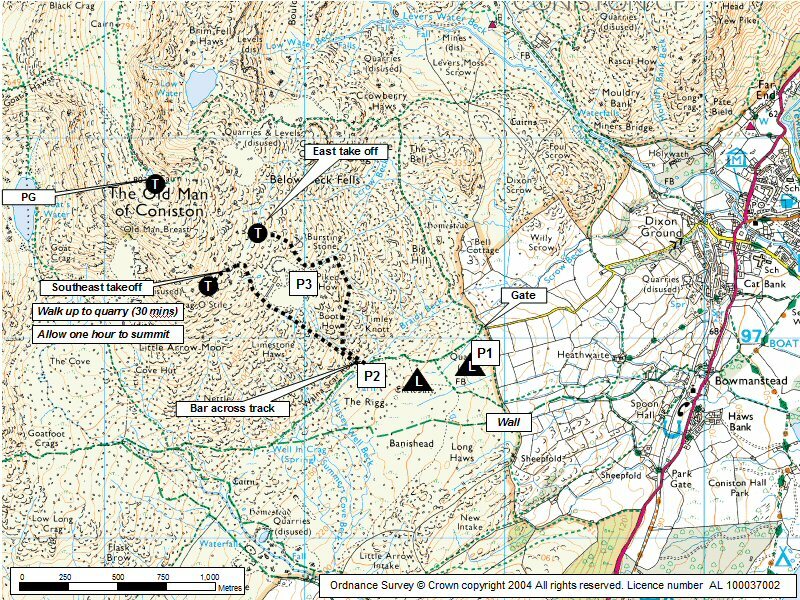 Mountain Rescue post is at the base of the steep hill (turn right) on re-entering the village of Coniston. Take-offs can be made almost anywhere but the summit area (2635� / 804m asl.) provides the cleanest launch points. The only fact spoiling this site for HGs is the lack of permission for 4WD access via the quarry road. Exercise care on the less than ideal take-off areas that are rocky and be wary of the site in fresh winds. Thermals abound and, on a half decent day, a large area of high mountains, both to the north and south, can be explored. Downwind XC potential is limited but cross wind out and returns show great promise but are yet to be fully exploited. Click on the photo for a full size image. 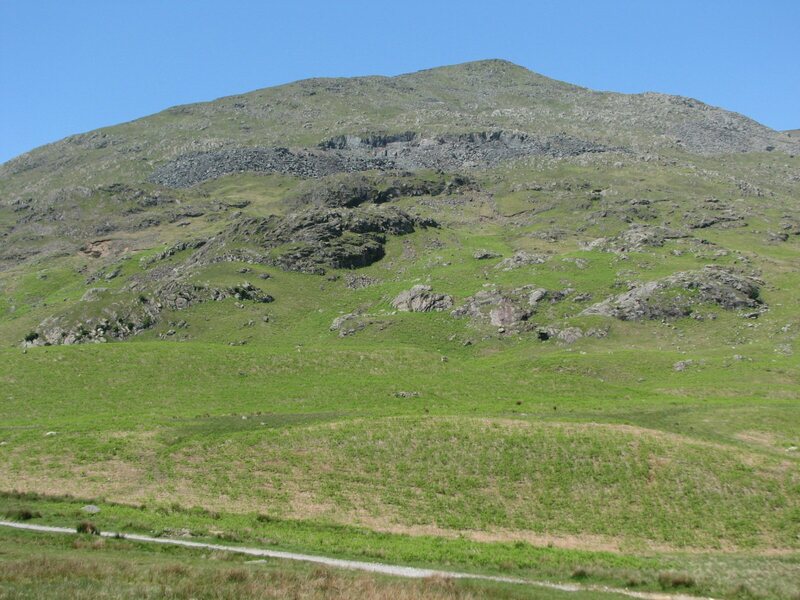 Looking up at the east flank of Coniston from the car park. The Walna Scar road is in the foreground. You need to get above the quarry that can be seen about three quarters of the way up the hill. Above the quarry is a shelf where the best take off position can be reconnoitred. 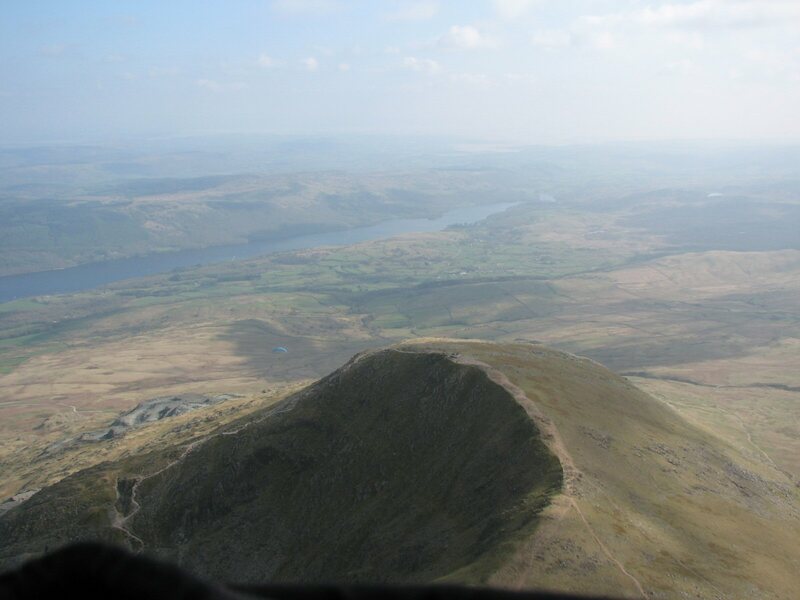 Taken from above the Brim Fell ridge and looking across to the summit cairn of Coniston Old Man. The quarry shown in the next picture can be seen on the left flank of the hill. Coniston Water in the background. Looking down on the Coniston car parking area at the eastern end of the Walna Scar road. It gets busy here most weekends. The area at the end of the track leading out to the right is generally used for landings as it's nice and level. There's loads of room. The undershoot - between the track and the Walna Scar road - can be boggy and a stream is near the road. The road down to Coniston is in the 10 o'clock position. No pub details are available for this site. Send your recommendations to the webmaster. This page shows records for this site. Some of the older records are not very detailed. More recent records may have an igc file available You can right click and download this to your PC. You can then use IGC Flight replay to view the flight. Notes : A number of big defined flights from many of our sites were flown this day. Notes : John reports "During one LCC (Circa late 80s ??) Ed Cleasby took us to the Old Man and managed to get us up to the quarry before we had to carry, it was a killer of a climb with a hang glider. There was little or no wind but the task was to fly towards Hard Knot pass left of take off to a turn point then a goal near Drigg where you had to land west of the railway line. I remember the flight well as it was memorable and it won the day. It was followed by a fillet steak in a local watering hole where Ed found me and took me back to the Sun Inn at Hawkshead via several ye olde watering holes. Follow the links to see the site in Google Earth and Google Street view. To access the former, you will need to have Google Earth installed on your PC. You can also upload your flights to GE - use GPS Dump (Links Page) to convert a variety of GPS file formats to a GE kml file. Google Street View - Parking The gate onto the fell at Coniston - it can get very busy here. Take off is above the quarry directly vertical from the top of the waymark sign - a long walk up! 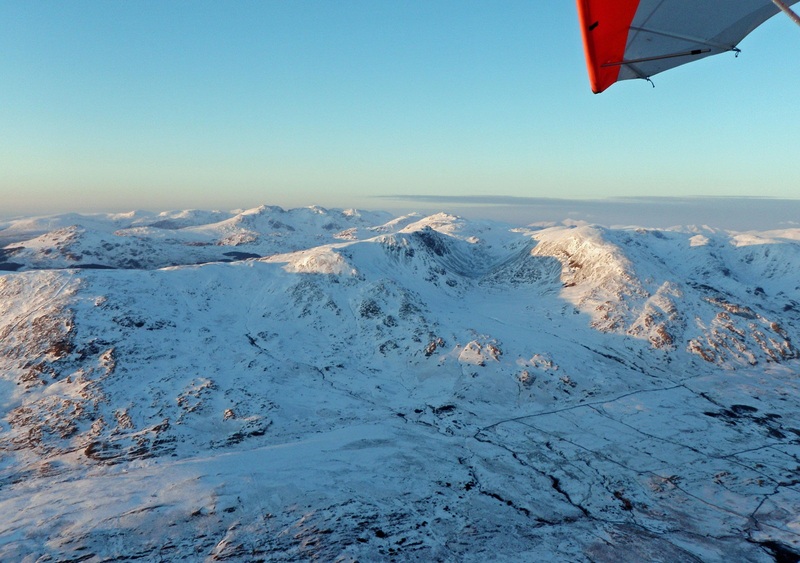 The Cumbria Soaring Club makes no guarantee of the accuracy of any content of this website, which includes content published without editorial control, and will accept no responsibility for any incident or consequence however arising. Hang gliding and paragliding are dangerous sports and pilots must take full responsibility for their participation.